In a season where the Revolution has been caught of guard by four sudden in-season retirements (Dustin Pease, Jason Repko, Dallas McPherson and Jeff Fiorentino), this transaction comes as the exact opposite. 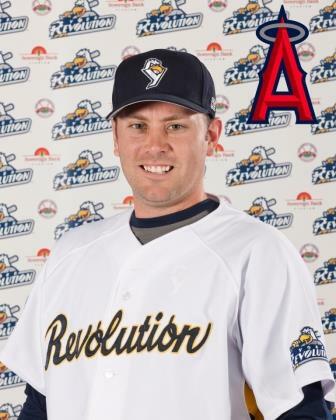 Thought to be retired, outfielder Val Majewski has re-joined the Revolution for at least their series in Lancaster this weekend that will end the first half. Whether this is just temporary or if he’ll be with the club longer remains to be seen. Last year Majewski split the season between the Texas Rangers Double and Triple-A clubs in Frisco and Round Rock, TX. The season prior in 2011, he was plucked off the Revolution roster mid-season by Texas and finished the year at Round Rock before returning to York for the playoffs, helping guide the Revs to their second straight championship. The Revolution had reached out to Majewski earlier in the season when they were going through roster difficulty and needed outfield help. Majewski re-buffed those requests, but apparently has had a change of heart, even if his time with the Revs is only temporary. Majewski played against York with the Atlantic League Alumni team in April in an exhibition game at Fan Fest, and very much looked in game shape and ready to play. His birthday was on June 1, making him 32. This marks his 11th professional season after a collegiate career at Rutgers. York Dispatch Revolution beat reporter John Walk tweeted this out earlier; former Revs reliever pitcher Josh Judy has been moved by the L.A. Angels to the Triple-A Salt Lake Bees. He had been pitching with the Double-A Arkansas Travelers since his contract was purchased by the Angels from York on May 2. Judy pitched in just four games for the Revolution, allowing three hits and a run in four innings, with five strikeouts and a walk. With Arkansas, he posted a 3.60 ERA in 14 appearances and 15 innings, striking out 14 and walking four. Opponents hit .232 off Judy, and he converted six saves. Judy made 12 appearances in the Majors for Cleveland in 2011, and our assumption was correct that as soon as a Triple-A spot opened the Angels would move him up. In his first two games with Salt Lake, he hasn’t allowed a run in 3.1 innings over two appearances. Should Judy earn a promotion to the Majors, he’d be the fifth former Revolution player to accomplish such a feat. We’ve been in business almost two years here at BlogToBlogChamps, but we are just getting to our first ever NBA post! However, now that the Revolution have three connections to the Cleveland Cavaliers, it was time to pad the post count. Prior to the season, now former Sugar Land Skeeters Team President Matt O’Brien left that post after just one season to head up the Cavaliers corporate sales department, wrapping up several years in minor league baseball with the Kane County (IL) Cougars, West Michigan Whitecaps, Somerset Patriots, Long Island Ducks, Myrtle Beach Pelicans, York Revolution and Sugar Land. 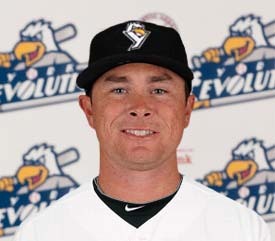 O’Brien was Revolution General Manager from the team’s founding in 2007 through the 2010 season. Now former Revolution Vice President of Business Development Neil Fortier has joined forces with O’Brien a third time, as the Cavs Director of Corporate Partnerships. Fortier worked with O’Brien in both Myrtle Beach and York as an Assistant General Manager. He concluded his 7-year tenure with the Revolution in June to move to Cleveland. However, the Cleveland NBA franchise is the “Cavaliers” thanks to the father of Revolution pitcher and 14-year MLB veteran Brett Tomko. Yeah, really. Good enough for me. In their inaugural season the Cavs needed that attitude, as they posted an NBA-worst 15-67 record under the direction of Head Coach Bill Fitch, who had previously been the head coach at you guessed it, Bowling Green State University. We’ll post good ejection videos here from time to time. Rome Braves manager Randy Ingle remains an all-time favorite. This one comes from the Atlantic League, featuring Somerset Patriots third base coach Shane Spencer. You might remember Spencer as an outfielder with the Yankees World Series Championship teams in 1999 and 2000. He also enjoyed big league time with the Indians, Rangers and Mets, playing in seven MLB seasons. Spencer completely shoved Jonny Tucker out of the shot! Who knows where he landed, but he did not appear in the camera shot again, so he must have flown pretty far. That’s a big man running into a man who’s not so big. While there was nothing too creative about Spencer getting his money’s worth nor did he make a big display, his method of getting in front of the umpire was a new one for me. Spencer was suspended for Somerset’s series finale at Lancaster on Thursday for making contact with an umpire, just a one game suspension. Getting thrown out three times in a half when you’re not the manager is pretty rare. The whole thing kind of reminds me of the Seinfeld episode when Kramer is playing golf with fictional former baseball player Steve Gendison, and he gives him a 2-stroke penalty for cleaning his ball on the green per the rules. As Kramer said…he LOST IT! Andy Etchebarren is now 70 years old. He’s in town after appearing at the Brooks Robinson Classic Golf Tournament in York on Monday, and is spending his birthday week at the ballpark with the Revolution. The 2011 Atlantic League Manager of the year brought the Revolution their first two ALPB Championships in 2010 and 2011, and his number 8 sits alongside Brooks Robinson and Jackie Robinson as retired in center field at Sovereign Bank Stadium. These miscellaneous musings are in his honor. 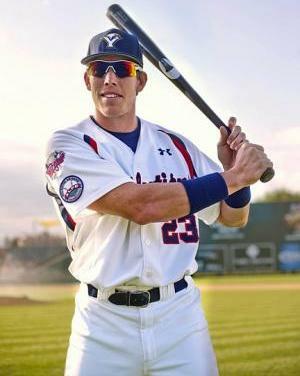 In a York Revolution roster move that became official on Tuesday, outfielder Jeff Fiorentino has decided to retire, and the Revolution has filled his spot on the roster with Mark Teahen, a veteran of 831 Major League games over seven MLB seasons. Teahen, who was a first round draft pick of the Oakland Athletics in 2002, made his Major League debut for the Kansas City Royals in 2005 after a June 2004 trade in which Oakland traded him while in Triple-A to Kansas City in the three-team deal that sent outfielder Carlos Beltran from the Royals to the Houston Astros. A fielder who has primarily been at third base, Teahen can also play first and corner outfield. As an everyday player for Kansas City for five seasons (2005-2009), Teahen averaged 135 games played a season for the Royals, and enjoyed his finest season with them in 2006, batting .290 with 18 home runs and 69 RBI, each career MLB highs in a season. A trade to the Chicago White Sox saw Teahen appear in 77 games and 51 games with Chicago in 2010 and 2011 respectively, and he was traded again during the 2011 season to the Toronto Blue Jays where he last notched Major League time, 27 games. Lately, Teahan spent the entire 2012 season with the Washington Nationals Triple-A affiliate at Syracuse, and has played so far this season at both Triple-A Reno (Arizona Diamondbacks) and Triple-A Round Rock (Texas Rangers). 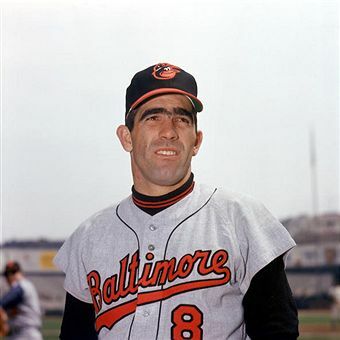 As a Major Leaguer, Teahen has 67 big league home runs to his credit, with 332 RBI in 831 games. He’s a career .264 hitter in over 2,800 MLB at bats over seven seasons. The departed Fiorentino batted .320 with four home runs and 27 RBI in 62 games with York in 2012 after joining the Revolution from Oakland’s Triple-A affiliate in Sacramento. This season, Fiorentino was actually second on the Revolution in hitting at .328, good for fifth in the Atlantic League. In 37 games he hit three home runs and drove in 21 runs. At 30-23 through June 14, we can all agree that the Revolution are putting together a pretty solid first half, and if they aren’t able to catch Sugar Land/Somerset over the final 17 games of the half, they’ll start the second half with more than a decent shot to make the playoffs as either the second half winner or in a wild card scenario.